Great vibe! Right next to the beach, surf lessons/board rentals and yoga available every day. The Aura Bar on site is amazing and the staff is super nice. We didn't use the kitchen, but the toilets and our room were clean. Amazing hostel with beach access and super chill people and staff. Tons of good vibes. Really great place to stay as a solo traveler as everyone was so nice and welcoming. Definitely recommend to anyone traveling through Costa Rica! Great for surfing non stop. Located right on the beach. Really cool hang out area. Could do with some new pans for the kitchen and accepting card as payment at reception (closest ATM is 3 km away). Nice dorms with air conditioning. Good size indoor and outdoor kitchen. Lovely communal area with sofas and Netflix. Amazing location and can walk out the hostel straight onto the beach. Can not pay by card so make sure you have cash. A nice hostel right by the beach! Great places to hang out - tons of hammocks, two kitchens, and a lot of tables and games and places to chill. Since it's on the beach, naturally, sand gets everywhere but they cleaned regularly. Can get a bit hot but it was totally fine for me. They charge for drinking water, there are no towels, and only two bathrooms for a lot of beds meant waiting sometimes. 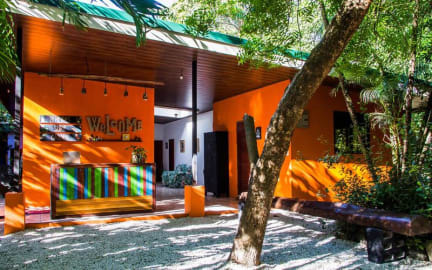 Cool hostel with a chill vibe! 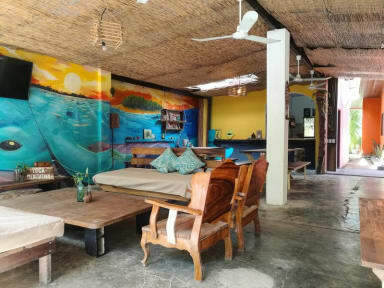 Located on the beach just 100m from what people were saying is best surf break in Santa Teresa! Stayed in 4 person dorm and was a bit squished when full and had no AC in my room so it was hot (others had AC so it might have been a booking fault on my half). Cool hang out area with 2 kitchens! Dont know if it was just when i was there but it was all argentinians staying there so not being able to speak spanish made for not the best social scene! Nice location, very close to the beautiful beach. There was no room key and the reception wasn't always occupied. I would definitely suggest to bring a lock. The kitchen was well equipped with all amenities.